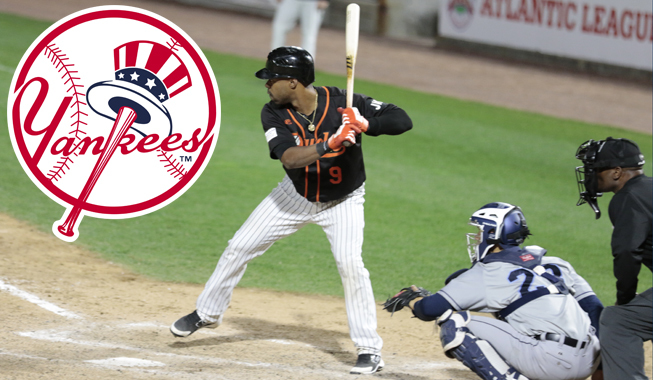 (Central Islip, N.Y., May 24, 2018) – The Long Island Ducks today announced that catcher Wilkin Castillo’s contract has been purchased by the New York Yankees organization. He will report to the Triple-A Scranton/Wilkes-Barre RailRiders. Castillo played in 20 games for the Ducks, accruing the second-highest batting average in the Atlantic League among catchers (.314). He added two home runs, 12 RBI, 10 runs, four doubles, one triple and a .400 on-base percentage. His stint was highlighted by an 11-game on-base streak from May 6-19 in which he compiled a .378 batting average and a .465 on-base percentage. Defensively, the Bronx, N.Y., resident committed just one error in his 20 games behind the plate and caught six runners stealing, the second-most in among ALPB catchers. The 33-year-old rejoins the Yankees organization after splitting the 2017 season between Double-A Trenton and Triple-A Scranton/Wilkes-Barre. He played in 59 games there last year, totaling three homers, 13 RBI, 18 runs, eight doubles and 11 walks. The Dominican Republic native looks to return to the Major Leagues after spending parts of two seasons with the Cincinnati Reds in 2008 and 2009, hitting .314 with two RBI, six runs and one double over 22 games. Castillo becomes the fourth Duck to join a Major League organization in 2018. Infielder Giovanny Alfonzo was signed by the New York Mets in March, catcher Alex Burg was signed by the Los Angeles Dodgers in February and catcher Jordan Pacheco was signed by the Minnesota Twins in January. Four Ducks players had their contracts purchased by Major League or foreign professional clubs in 2017, including a franchise-record three that returned to the MLB level (Tim Melville, Twins and Padres; Henderson Alvarez, Phillies; and Quintin Berry, Brewers) in the same season that they played on Long Island.